A well-presented and modernised three-bedroom semi-detached home measuring 915 square feet and featuring a stunning kitchen and driveway parking for two cars. 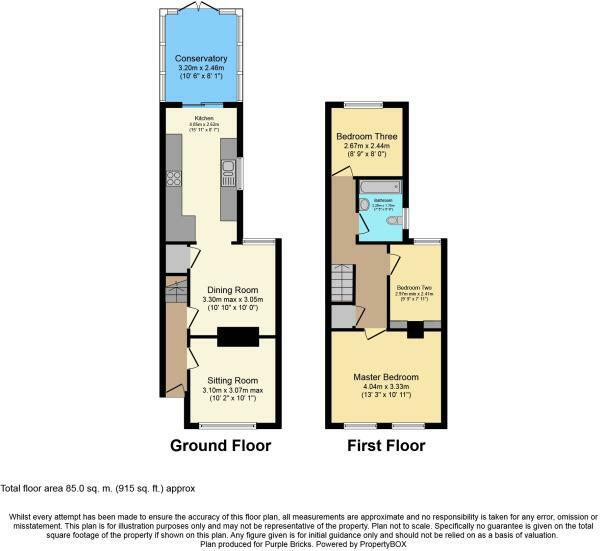 As the floorplan shows, this property measures 915 square feet over two floors. On the ground floor is an entrance hall which leads to the principal reception rooms. To the front is a sitting room which takes its light from a large window and provides enough space for a good size sofa. The beautiful and well-presented kitchen/dining room is the ideal space for cooking and entertaining. The kitchen area features a range of modern wall and base units with quartz work surfaces, a sink with mixer tap, a range cooker with extractor, concealed space for washing machine and tumble dryer and a space for a fridge/freezer. There is also a very useful fitted pantry cupboard. The dining area is large enough for a good size dining table and six chairs. From the kitchen/dining room is a conservatory that features central heating and enjoys some of the best views of the garden. Upstairs there are three bedrooms all served by a well-presented and modern bathroom suite with shower. Outside the east-facing garden is mainly laid to lawn with a small area of patio. Of note is the shared access to the side which allows easy access to and from the garden for bins or garden furniture. Located in the HIGHLY SOUGHT-AFTER East of Ipswich within walking distance of Ipswich Hospital, Two Rivers Doctors Surgery and all amenities including local shops and bus routes. The property is also within walking distance of the town centre. Disclaimer - Property reference 651742-1. The information displayed about this property comprises a property advertisement. Rightmove.co.uk makes no warranty as to the accuracy or completeness of the advertisement or any linked or associated information, and Rightmove has no control over the content. This property advertisement does not constitute property particulars. The information is provided and maintained by Purplebricks, covering Anglia. Please contact the selling agent or developer directly to obtain any information which may be available under the terms of The Energy Performance of Buildings (Certificates and Inspections) (England and Wales) Regulations 2007 or the Home Report if in relation to a residential property in Scotland.